French-style "macarons" and simpler macaroons both rely on beaten egg whites. 1 What Do Bakeries Use in Their Whipped Cream? For many bakers, cream of tartar is a rather mysterious ingredient. It adds no discernible flavor, has no aroma and its appearance -- a generic white powder -- gives no clues about its purpose. Yet many recipes call for it, especially in treats such as macaroons that are made largely from egg whites. This is because cream of tartar helps turn egg whites into stable, long-lasting foams. At first glance, cream of tartar appears to be a quintessential example of an artificial additive. It's visibly a powdered chemical, and looks like it was formulated in a giant laboratory somewhere. The reality is more interesting. Cream of tartar is actually made from crystals of tartaric acid, which settle out of grape juice as it ferments into wine. Winemakers filter the crystals from the leftover sediment after the wine is made, and it's these crystals -- suitably purified and finely ground -- that are sold as cream of tartar. Turning sticky, slithery egg whites into fluffy, snow-white meringue is a more complex project than it appears. The proteins in the egg ordinarily huddle up in relatively tight molecules, held together by powerful chemical bonds. The wires of your whisk, or the beater of your electric mixer, physically shear the bonds keeping the protein molecules coiled together. As the strands of protein unwind and stretch out, they form new elongated bonds that trap the air left by the whisk's passage. That stretching out process, called denaturing, is accelerated by acidity. Adding cream of tartar to the egg whites helps them whip more quickly and create a longer-lasting foam. 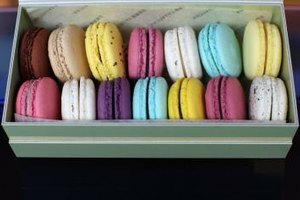 Macaroons rely on the meringue for their shape and structure. If your meringue isn't whipped thoroughly enough, or if its foam only forms weak bonds, it can deflate badly while you're folding in ingredients such as nuts or coconut. The slow-baking cookies can also deflate in the oven before the heat cooks and sets the egg whites into their final form. By helping the egg proteins denature, cream of tartar gives the foam more and better molecular bonds. That means they'll retain their shape and texture more reliably. Cream of tartar is a good choice for macaroon-making because of its neutral flavor, but you can use other acidic ingredients if necessary. Lemon juice works just as well, and its flavor is subtle enough to be unobtrusive in the finished cookies. The crystals sold at your supermarket to keep fruit from browning are made of ascorbic or citric acid, and those are a suitable substitute if you have some on hand. Warming the egg whites to room temperature before whipping them is also helpful, speeding the denaturing of the proteins. How Is Emulsified Shortening Used in Baking? Do You Still Need Baking Powder & Salt If You Use Cake Flour?